Go to the video at the bottom of this page. After my success using Jacob Butler's convex bevel method with my DMT stones, I ordered a set of three 8" x 3" x 1/2" Norton India stones from SharpeningSupplies.com ($47.91 for all 3), along with a quart of Norton honing oil. I chose the 3" width because I have some plane irons that are over 2" wide, even though that meant I had to get thinner stones. I held off getting a matching hard Arkansas stone due to the cost ($79.99), since I had a tiny one I had gotten at a knife show 30 years ago. Ordered Saturday night, they arrived Thursday evening, so I gave them a quick try. WOW! I don't know what kind of crappy oilstone I had tried in the past. These were far better. I didn't even bother with the coarse stone at first, the medium and fine cut so fast. I tried them on an iron from a small wooden coffin smoother and a 3/4" chisel. 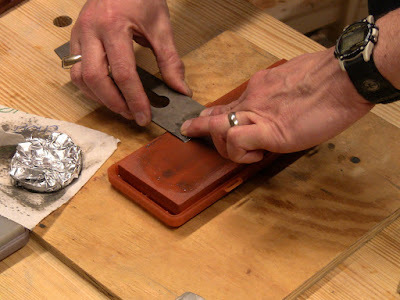 The Arkansas stone gave them an extra fine edge, although its small size made it hard to use. Based on that, I decided it was worth investing in the full-size hard Arkansas stone from SharpeningSupplies.com. It arrived just as quickly as the others had. These stones are also available from Tools For Working Wood; their shipping is also fast. 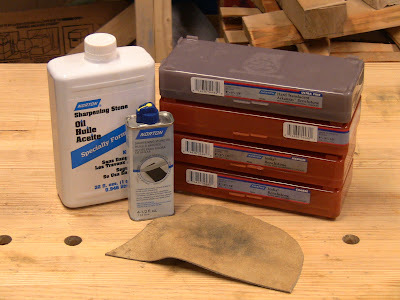 My completed set of sharpening supplies: oil, 3 India Stones, hard Arkansas stone, and a scrap of leather for a strop. 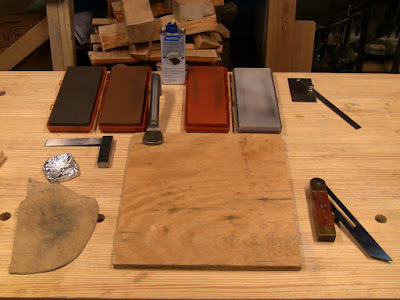 The sharpening setup, clockwise from top left: the coarse, medium, fine, and Arkansas stones and oil, a protractor set to 30 degrees for checking progress, a bevel gauge set to the same angle to stand up as a visual reference while working, a board held down securely to protect the bench from the messy oil and swarf, the leather strop, a disk magnet wrapped in foil to clean off the stones, and an engineer's square to check for square grinding. The magnet was Jacob's idea for cleaning iron filings off the stones without wiping off all the oil. It works pretty well, although it's difficult to clean them off the magnet itself if you don't cover it. The foils works, but wears through easily. Sharpening is messy, so I wore an apron and kept a stack of paper towels handy. A bit of terminology here. I've seen the flat side of a chisel or plane iron opposite the bevel called different things: the flat, the back, the face. Not sure if we're coming or going here! I'll use the term face. 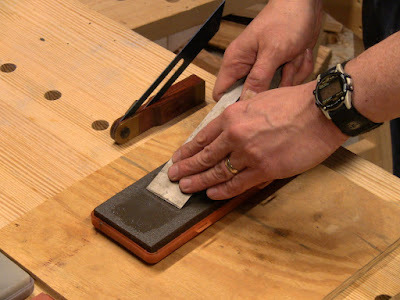 The sequence I followed was to work bevel, then face, vigorously on each progressively finer stone, then strop at the end, starting with whichever stone was dictated by the initial condition of the blade. The edge can be maintained thereafter with just the fine India and hard Arkansas stones. The results using these were superb. See the video at the bottom of this page showing them in use on a flea market Stanley #4 and another old Buck Brothers chisel. 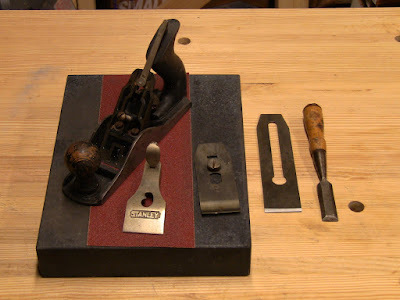 The photos below repeat the process with a Stanley #3 and an old chisel stamped "DUNLAP" and "Germany". I flattened the plane a bit on the sandpaper-covered granite reference plate. I've started the iron bevel on the coarse stone, so it's already cleaned up a bit. Working the plane iron bevel on the coarse stone. This didn't take much work, since it was in reasonable shape. Note the bevel gauge serving as visual reference to the side. A few steps later: working the face on the fine stone. Working the bevel raises a burr; working the face turns the burr into a wire edge which will come off in the oil or on the strop. You can also see where I've used the magnet to clean off the coarse stone. Stropping after wiping off the oil, alternating sides for several strokes each. This removes any remaining bits of wire edge. 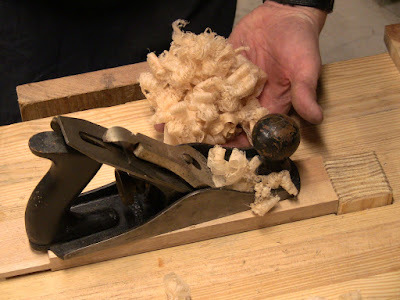 I put the plane back together, adjusted it for smoothing, and tested it on the face of a scrap of cherry. The resultant cloud of fine smooth shavings. Now that's pure joy! 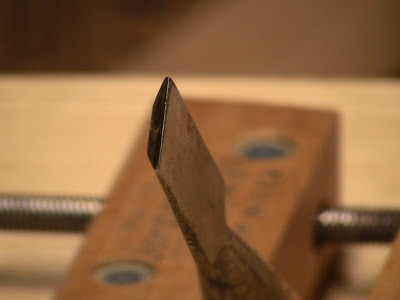 The chisel edge. This is going to take some work. The chisel had been ground at about 33 degrees and was dubbed over and slightly nicked. Not quite bad enough to go to the powered grinder, but close. I spent about 10 minutes working it on the sandpaper and reference plate, just going for metal removal to clear the dubbing and nicks, working to just under 30 degrees. The edge after going through the four stones and strop. 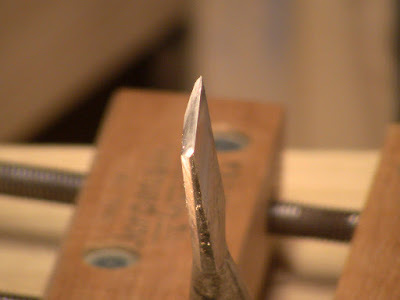 It's hard to photograph a sharp edge! 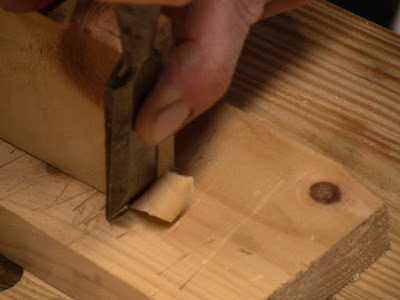 The chisel taking a nice fine pine end-grain shaving. Some of the editing in the video below is a little harsh because I was trying to stay within YouTube's 10-minute limit. Audio is mono only (I need to figure out how to duplicate the mono on both stereo channels). The end result is that I'm extremely happy with this method. It's fast and effective for various sharpening media; I have no doubt it would work just as well with waterstones. It's completely portable with fast setup. The India and Arkansas stones should last me 30 years, which is one reason I chose them over waterstones. While waterstones may cut faster, they also wear faster. These stones get the job done just fine with only a few minutes of effort. So no fussing around, back to working wood quickly. I think I finally have my recipe for hand sharpening. Thanks, Jacob! I've seen some mention of rubbing stones on concrete to flatten them, but I don't think that would work for Arkansas stones. 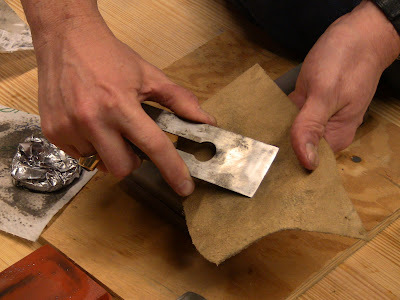 However, careful use (using the whole surface evenly in your sharpening motion) should avoid dishing. Remember that the Arkansas stones in particular are much harder than water stones. Interesting method. If I'm not mistaken, I believe Paul Sellers does the curved bevel type as well. Yes, I found it very interesting to see that Paul uses this method. He also has a simple training aid in his sharpening DVD to help you get used to the feel of the maximum angle. That avoids the problem of lifting too high, which sharpens at too steep an angle for effective cutting. My waterstones never worked harder before, now they are performing beautifully using this method, I use the whole stone all the time, I use the bottom of the coarse stone to flatten the rest, for the 8000 I use the bottom of the 4000, they stay flat for much longer, I don't worry too much about it anymore. Stopped using the Nagura stone too as I get a lovely slurry now. I don't know if you're still reading comments here, but how do you like these stones two years in? Are you still using them? The price is the best I've seen, and my much-loved double-sided Brookstone oilstone just isn't big enough for most of my plane blades. Yes, I like these Norton stones a lot. A good balance of price and performance. In fact, these are the stones I keep in my portable sharpening station that I use at home and doing demos, so they're what I use most of the time.